The Hate for Dragon Ball Super Is Laughable…Nostalgia To Blame? This is really a continuation off of my last post…Nostalgia Prevents Progression. I originally was going to make this a quick example, but found I had quite a bit to say about it…so here goes. Dragon Ball Super is amazing…to me anyway. It had a bit of a slow start, but has since picked up to be even better than Z. But I see a lot more hate for the show than love, which is ridiculous. But nostalgia has struck again it seems. The first thing I noticed about DBS is that it feels just like DBZ, as if the show never stopped. There are some minor differences of course, the way each series was different, but the core is still there- Goku beating the crap out of people. And actually a lot of the humor in the show is reminiscent of Dragon Ball. But here is where I get a laugh about things. The biggest complaints about Z were inconsistent power levels, slow moving episodes with too much powering up, too much filler and much of the cast being left in the dust due to being unable to keep up with Goku and Vegeta. In Super, the stories and fights are much more condensed, wrapping things up in a quarter of the time it took for Z. Instead of a villain being the main focus for 3 or more seasons, they keep it down to one. This hurts the story telling a bit, since there is less time to spread it out, but that doesn’t mean the stories are bad. The Black Saga had a great story and was well told. So in other words, the show moves much faster and it feels like a lot more has happened in it, despite being like half as long as Z. And there are no lengthy power ups that I can recall. Though, really, there weren’t many in Z either if I’m being honest. It’s more building anticipation than anything. People complain that there is too much talking during fights in Super. My response to this…Have you ever watched any of the other Dragon Ball series. This one is by far the least guilty, except for maybe Dragon Ball. Goku’s fight with Frieza stands out to me the most. I am pretty sure Bulma and King Kai have more air time during the fight than the two fighting. Is this annoying? Usually, but from a production stand point, this is all understandable. It is a lot of time and effort to just make people fight for an entire episode and it could become rather dull and expensive, though it is hard to see how on the former. But most people don’t realize this. And the DB series usually take these moments to explain what’s going on, or else show the effects the battles are having elsewhere. So, to me, this isn’t really all that big of an issue. Now for filler. Super does have filler, though not nearly as much as Z. And the filler is actually quite good, not to say that some of Z’s wasn’t, though most of it was awful and boring. In Super, the filler usually consists of quite a bit of action and/or comedy. And really, filler is necessary, because it would be pretty dull to save the world from a villain one episode, and then be threatened by another the next. Super does a great job with the filler, it really does. So this is yet another improvement over Z. Now on to the cast of characters dwindling relevance. Is this an issue in Super? Of course, but they have taken great strides to include a lot of the cast, even if it is just for a moment. We have gotten to see some of the old Z fighters participate in DBS for the first time since the early DBZ sagas, and it is more than welcome to me. This exclusion of characters is probably the most complained about thing from Z, and now that they actually made efforts to include them…guess what? People hate it, mainly because they complain about power scaling…another thing that was a huge issue in Z.
Yeah, in the Tournament of Power saga, there certainly is a ton of questionable means of powering up, but by now, this is nothing new and fans should be well beyond caring about that. The show would be extremely dull if there wasn’t power issues. It would eventually just come to one character killing someone else in one hit, next villain, same thing, next fight, same thing. Like, I truly can’t wrap my head around how upset people get over this. Like, if everything in every movie and show made sense, they would all be boring and quite terrible for the most part. That is not why we watch shows. We watch them so reality floats away from us for a little bit, not so we can whine and criticize something every time it strays from reality and sense. And finally, people complain about the show being too focused on Goku, and poorly written. Seeing as Goku is the main character of the series and has been for like 30 years or whatever, how is anyone surprised by this? His personality is what drives the show. It is how he wins over the hearts of his enemies, and if they are evil enough, his personality drives him to improve constantly no matter the odds. That has been true since the first episode of Dragon Ball, and remains so today. And the stories have never really been good, or really in depth I should say. It is a show about super powered beings pummeling each other. Someone threatens to destroy the world, and someone stops them. It has been done thousands of times in every show ever. What are they talking about, poor writing? ITS AN ACTION SHOW!!! WATCH IT FOR THE ACTION!! Which in my opinion…Super has the best in the series. People spend so much time trying to calculate power levels and judging the way they go about increasing them. What does it really matter, honestly? It is so cool to see these characters just fight it out, and the more transformations, the cooler it gets in my opinion. Dragon Ball is all about absurd transformations and always has been. It is what makes the show interesting. Dragon Ball Z is such a beloved show for anyone who grew up during the time it aired, that a new series continuing after it is nothing but an insult to it’s existence. 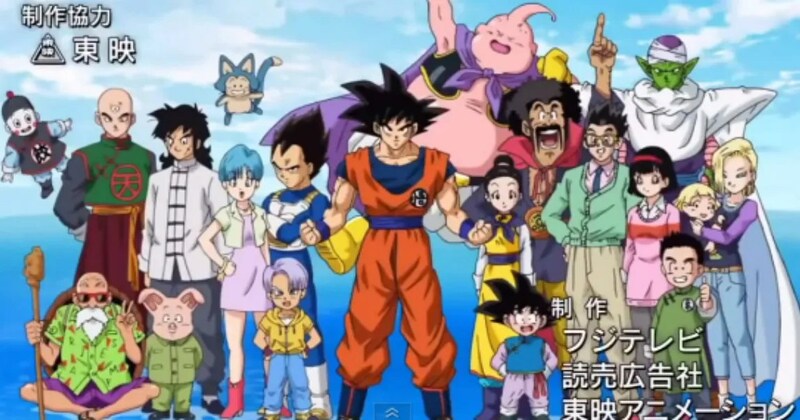 Many of these people complaining about Super probably haven’t even seen Z in over 10 years and only have that nostalgic feeling…you know that happy, warm memory of their childhood self coming home from school and running to the TV to see what amazing adventure Goku and the others would take them on next, and a very vague memory of the actual show. Yeah…I have those feelings…I love Z, but that doesn’t stop me from loving Super. They are essentially the same show. Nostalgia doesn’t make me blindly hate something for no reason. And I own every episode and movie of DB, DBZ and GT and watch them all at least every 3 years, so it’s not like I’m speaking from nostalgic memories. But again, I feel like nostalgia is trying to prevent progress, in this case a series progressing forwards. And negative press will just likely prevent new things from coming out in the future, which is really a tragic shame. But think what you will, nostalgically influenced or not. I for one am overjoyed that my favorite TV show has been revived into something new. And really, why does it even have to be compared to other series it is related too? Who cares which is better? As long as you enjoy it. But those nostalgic feelings won’t allow any room for anything other than that one original, childhood memory. Even though the show took steps in remedying old fan complaints, it is nothing but trash, for it can never be able to take on the force that is nostalgia! But okay, I feel like I am going on a rant or something. Nostalgia just really annoys me. I will end it here. Many people are looking forward to the upcoming release of Dragon Ball FighterZ. While this looks to be an awesome game, I think what we need now is a game dedicated to Dragon Ball Super. And if not dedicated to the series, then doing something like they did with Tenkaichi 3, where they covered most of Dragon Ball, Z and GT, not to mention the movies and then some. Tenkaichi 3 is by far my favorite Dragon Ball game. With fun gameplay and an unrivaled character roster, no game has come remotely close to it since it’s release. Now imagine if they could take that game and just add DBS to it. It would be something amazing for sure. The series, in its 111 episodes that have aired so far, has introduced countless new characters and transformations. Heck, the Tournament of Power alone could make an amazing game. The tragic thing about this is that we will never get a game like Tenkaichi 3 ever again, simply because games are much more condensed now, and take advantage of DLC to bulk it up. This is the case of FighterZ, as well as just about every other fighting game out there nowadays. But we’ve played through the Z series dozens of times in our lifetime. Now it is time to make something new for a new, amazing show. Though really, I suppose it would be more prudent to wait until the series finishes before making a DBS dedicated game. At least they are including some characters from the new series in the more recent games, so that’s a start. There are always a few games a year that everyone absolutely raves about, swearing they are the best games ever made and all that. I never pay attention to reviews or fan feedback, because a lot of it is nitpicking or unworthy praise or something, so it is very rare that I will buy a game based off of just global praise alone. I like to be the judge of a game, simply by seeing if it looks fun. On those rare occasions when I do buy a game (on sale, of course) that the world united on praising, I have found that 99% of these games are quite mediocre, which makes me feel that I am looking for something much more different than the regular gaming community. But don’t get me wrong, some games can be overrated and still be amazing, The Last of Us, for example. I would give this game a 10/10, but for years I heard it was easily the best game ever made, which to me, it is far, far from that. So where does Dragon Ball Xenoverse fit in to all this; as a great, yet overrated game, or a pile of mediocrity? For starters, know that I did not buy this game because the world was calling it “the best Dragon Ball game ever made!” I bought it because I absolutely love the Dragon Ball franchise and this was a new and exciting twist for the game. It is one of the worst Dragon Ball games I have ever played. It is not the worst, but probably in the top 5 worst ones. Like, I can’t see why anyone even likes this game. It is so boring and seems to go on forever. I was miserable practically the entire time I played it. So why do I hate it so much? Where do I begin? For starters, when I bought it, I got the game and season pass on sale for $20 on the PlayStation Store. So when I went to access the DLC, it wouldn’t work, or rather, it didn’t show up, claiming I never bought it. After literally 45 minutes of research on the internet, I found that the DLC was a major glitch, and then I had to look up how to install it, which involved a whole lot of messing around with settings and such on my PS4 and then re-downloading it. I am not very tech savvy, so I would never have figured that out on my own, and I am willing to bet 95% of everyone else would not have either. So that’s a huge strike for me right there. But since it has nothing to do with the gameplay itself, then it’s sort of forgivable. That is until we get to the actual game. For starters, it takes like 30 seconds to connect to the server to be able to even play the game. This is really great, since I only want to play single player. You start out in some hub town place, which is far too big and your characters walk too slow. All the places you would want to visit regularly are all spaced out as far as possible from each other, so that it takes like 3 minutes of walking just to reach a destination. You are a super powered being! Why can’t you just have the option of quickly flying around!? When you finally are able to start a mission, it brings you to the character select screen. Aside from having a very tiny selection of characters compared to previous Dragon Ball games, I have another annoying observation. There needs to be a confirm button after selecting your characters! Typically, you get to pick your character and then 2 others to fight along side you. But so many times I end up choosing the wrong character and then it goes into the match immediately. There should be a “Use These Characters?” box that allows you to pick yes or no. And I usually end up picking the wrong character because the selection thing moves so stinking slow that I always end up pressing the select button before the right character is lit up. Now that we finally get in the game with the right characters, it turns out to not be worth the trouble at all. The gameplay is so boring. All you do is throw punches, which send your opponents flying, then you have to chase after them, and repeat over and over again, until you discover a combo that doesn’t send them flying away. So you just do this combo over and over until your energy is charged up, then unleash your special attack to do a decent bit of damage. This is okay in the early parts of the game, but eventually the opponents have so much health that it becomes a very dull chore. I’d rather dust every house on my street then sit through this game again! But the fights aren’t that easy! So there’s a lot of frustration mixed up in that dull wearing down of health! For starters, let’s talk about blocking. It’s atrocious. Your character has to come to a complete stop for like 2 whole seconds before you can block. That might not seem like much, but when you’re in a high speed match against 2 or 3 opponents, it’s a friggin’ eternity. But the computer players, they can block whenever they desire. It’s so lovely to watch them do things you can’t. And speaking of doing things you can’t, some enemies just use their ultimate attacks like 5 times in a row, over and over again. SS Trunks and SS Vegeta seem to do this the most often, though I’ve since learned that this is a special Saiyan ability or something, that for a limited time they can spam the hell out of attacks that will kill you if hit by two of them. Saiyan ability or not, this should not be in the game. That gives them an enormous advantage and messes up the balance of the game. Another thing the computers seem quite adept at doing is hitting you with beam attacks. Unless you add the beam attack in the middle of a combo, you will most likely miss 8 out of 10 attempts. But the computers will hit 7 out of 10 and this is because they can somehow change direction mid attack. They can bullseye you with a Kamehameha Wave like it’s their business, because they change direction right as they fire it. But as the player, that is the worst, most useless attack in the game, for you will always miss. And no, you can’t change any direction while shooting it. And on top of that, they do not flinch when you punch them while they are charging up to do an energy attack, but one punch of a small ki blast will knock you out if you are doing the same. And speaking of ki blasts, you have the ability to shoot many quick ki blasts at a time, and oh my God, this is the most annoying thing in the world! You can shoot these all day at the computers, and if they hit them, which seems to be a 50/50 chance, it won’t have much effect usually, but man if you get hit, they will stop you dead in your tracks. And the computers use this constantly. I mean CONSTANTLY!!! It would be easier to push through a speeding train in real life than get through these ki blasts. And you know what else they use constantly? There are abilities that, if you have enough energy, will blow away all nearby opponents in one way or another. So if you manage to make it past the barrage of ki blasts, it’s only so you can then get blown away by these special attacks. And then you start all over with the ki blasts. So annoying. They overuse this ability like crazy! But chances are you will never even get to this point, because you will never be facing your opponent. You can lock on to someone, and you would think that they would automatically direct their punches at that person. Nope. You always have to manually turn your character to face your opponent, which is really awkward, especially when you are getting attacked by multiple enemies and can’t see anything. It’s annoying and stupid. Countless times I found myself punching at air because my opponent was behind me. This is the last complaint, though I probably have more that I can’t think of right now, and it is simply that the difficulty increases way too fast. The first few missions are simple. You could win with your eyes closed, but then all of a sudden, it’s like you are playing against pros, and you haven’t even fully learned the controls yet. And it just gets harder and harder from there. Bottom line, the game is boring and frustrating and is definitely not the best DB game ever made! It is not even a good game! I’ll stick with the Budakai and Tenkaichi trilogies. They are much, much, much better. It warms my soul however, to hear that nobody really likes the sequel, for it is EXACTLY THE SAME GAME! What A-hole developers! God dang it! I have been watching Dragon Ball and Dragon Ball Z in their entirety the past few months and while I love the series, there is one thing that really stands out that makes me ask “WTF!” And that is the position of guardian of the Earth, more specifically, Kami. What a BS character. We are first introduced to Kami in season 4 of Dragon Ball, shortly after King Piccolo’s defeat at the hands of Goku. Goku climbs all the way up to Kami’s Lookout high in the atmosphere I would assume. Why is his lookout so high up? While it never is said, I imagine it is so the guardian can easily watch over the entire planet, protecting it from well…I suppose…everything. Kami is the guardian after all. This would be fine and dandy except for the fact that Kami is a lazy, old piece of garbage who has nothing on his mind except making sure Mr. Popo waters the flowers everyday. I mean seriously, he is a piece of crap, only twice ever doing anything to help the earth. Let’s start from the beginning. Kami wants to become guardian of the Earth, but has a darkness inside him, so his predecessor does not approve of him to take the throne. In answer to this, Kami figures out how to remove this dark side of him, which becomes an entire evil entity known as Piccolo. This is where Kami’s BS really starts. Yep, right here, before he is even guardian of the Earth. Having been removed from all darkness and evil, Kami ascends to the throne. Yet ironically, Piccolo immediately sets out to destroy and invade Earth. And what does Kami do about it? So, in his haste and greed to become protector of the Earth, he creates a being that would destroy it, and then takes no responsibility for this evil twin. He just sits back and revels on his throne. What does he care if Piccolo kills everyone on Earth with his great power and demon army? No, instead the burden falls on Master Mutaito (I am guessing on the spelling here). That’s right, some poor martial artist, after seeing all but two of his martial arts students murdered at the hands of Piccolo and his demons, along with half the world’s population, the martial arts master develops the Evil Containment Wave, using his own life force to perform the move and trap the evil demon. A noble sacrifice. One that you might think the guardian of the Earth might make. But no, he was too busy doing nothing at all. King Piccolo returns decades later, and Kami shows his ignorance for his job once again, allowing Piccolo to kill a whole lot of people before Goku steps up and takes him down. Goku then climbs to Kami’s Lookout, only to find that the two inhabitants are both far stronger than Goku and Piccolo. That’s right, Goku had to give it everything he had to beat Piccolo, yet Kami reveals himself to be far beyond Piccolo’s powers. But he couldn’t be bothered to go fight his evil side. Why would he when there’s little kids willing to do the task? Kami informs Goku that Piccolo spat out an egg and that he must face what hatches at the next Martials Arts Tournament. Kami tells Goku he must live at the lookout and learn all that he can teach. Yet, Kami can’t even be bothered to train him. He makes Mr. Popo do it. When the time comes and Piccolo Jr. shows up, Kami disguises himself as a human named Hero and actually goes down to Earth to stop Piccolo, fearing Goku would not be able to do so. In other words, Kami makes a noble sacrifice as guardian for the first time ever. His plans backfire, and its Goku who winds up having to save him, actually preventing Goku from giving it his all until Kami was rescued. So he ends up being nothing but a liability. The next great threat on Earth is the Saiyans. Kami eases his conscience by training the Z fighters to prepare for the battle, doing nothing otherwise to save his planet. Then Garlic Jr. comes and takes over his lookout and almost turns all the people of Earth into his puppets. With Mr. Popo’s encouragement, the duo set off into some weird dimension to save the Earth. Mr.Popo had to constantly hold his hand through the whole thing, but in the end, he did something useful for the Earth. But we all know his real motivation behind it. He was ticked off something awful that someone else was sitting in his chair. But the real kicker is in the android saga. When Trunks, Gohan and Bulma discover Cell’s shed skin, Kami reveals that he has sensed a great evil for FOUR YEARS! He sat back and watched it fester, growing day by day. But do you think he mentioned it to anybody? Do you think he got down off his throne and went to take out the significantly weaker evil on his own? Nah, he just ignored it. This tactic has always worked out for him before, so he was sure it would now too. The Z fighters, they would take care of it, while he takes all the credit from the guardian galactic council or something in their monthly meetings. Kami finally gives up his life more or less to fuse back with Piccolo to power him up so they could defeat the androids. The only reason he did this was because he was like 500 years old and about to keel over anyway. A convenient way to live a little longer. He offered Piccolo the job of Guardian of the Earth when he sensed his time was near. If Kami fused with him, maybe Piccolo might one day take that job, so he could resume sitting in his chair, as power hungry as ever. What an A-Hole! Another thing that bothers me is that he states I think in the Saiyan saga that the Eternal Dragon is only as powerful as its creator, in this case Kami. So that is why they could not wish to destroy the Saiyans or whoever they wanted to with the dragon, for it was not within Kami’s power. So what I get out of this revelation is that Kami has the ability to bring people back to life, grant immortality, and basically grant any wish anyone may desire. If that is true, then wtf Kami? Why do you never bring people back to life on your own? The Z fighters fight all your battles, you think the least you could do is bring back the ones that die to save the Earth, or use your powers to undo the horrible wreckage that all the villains who plague the Earth have wrought. I am sure his power is limited in person, having to channel it through the dragon instead, but that’s just what he wants you to think…Kami you wrinkly, old bag. F U.
Dragon Ball Super American Release? If you are an avid Dragon Ball fan, then you likely have been watching English subbed episodes of Dragon Ball Super as they air every Sunday. It has been over a year since it debuted in Japan, one season is over, they are in the third saga and yet we still have no word if there is even going to be an American version with the returning voices of our favorite cast. I am sure there will be eventually, but what are they waiting for? Though I’ve watched all 35 episodes so far, I would immediately watch them again, for watching English dubbed versions is almost like watching a whole new show, and to me will really hit home when I hear Chris Sabat voicing Vegeta and Piccolo, Sean Schemmal as our beloved Goku. I will feel like a kid growing up all over again and I. Can. Not. Wait! For those who have not seen it, it is a great show. It has a slow start to it, but really picks up after several episodes. The first few suffer from poor animation quality as well, but this too is remedied fairly quickly. But other than that, it feels like another season of Dragon Ball Z. My first thought upon watching was, “Wow, it is like they never stopped making them.” It unfortunately keeps up with its infuriatingly slow pace to build suspense and wonder, and leaves you completely hanging on the edge at the end of each epsiode, forcing you to wait an entire week to see what happens next, just like when we were kids. I find myself longing for the day when I own the complete series on Blu-ray, so that I can just binge watch until my heart is content, just like I can do for DB, DBZ and GT. The series takes place right after the defeat of Majin Buu, so Dragon Ball GT did not happen yet, but there is no telling if it ever will run up until the events of GT, or erase it completely, which I am sure many fans would prefer the latter. I urge any fan to watch the subbed versions, but if you can’t handle watching shows in foreign languages like so many people I know, then just know that you are in for a treat when it finally airs here.